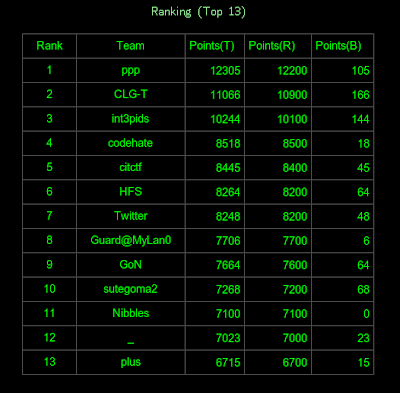 As you may know, I played Codegate CTF quals with Nibbles and we managed to be #11. As you can see, there was many good write-ups on the challenges. Despite being 11th, my friend SiD & I had the chance to go in Korea to play CTF finals and it was great: discovering Korea, playing CTF (managed to arrive 4th! ), meeting other teams, conference speakers and other nice people. Also, networking session was awesome! I didn't have the time to see the conferences, but it reported to be very good as well. Challenges by LM**2 were again interesting, excellent write-up from HFS (winners) for the encrypted shellcode (only team to solve it!). I should write-up on some challenges too if I have time. In the meantime I would love to see the challenges available on the net, maybe on intruded? At the same time, Hackito Ergo Sum (HES) security conference was happening in France: impressive program and speakers (slides are available), they also organized a wargame with OverTheWire guys (reputed for their good online challenges), and recently even made it available among their other wargames (thank you, starting to play hehe!). Among the next events are CIT CTF on May 15-16 (registration) from our Russian friends of Codegate, and obviously Defcon CTF quals on May 21-24 (registration). Good luck and have fun if you're a player too!